Features: Made of high quality metal, durable and practical. 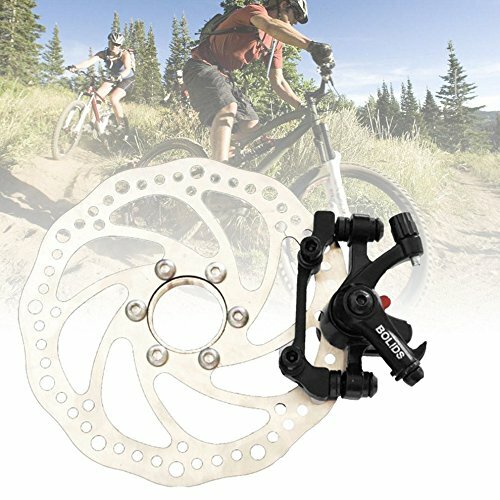 Universal for mountain bike, cycling and bicycle. The brake disc is rotating type, delicate and non-rusty. Easy to install and convenient to use. To create a safety protection for your bike. Description: Elegant appearance, fine workmanship, precise dimension. A good replacement accessory for your bike. Suitable for those people who love riding. Specifications: Material: metal Color: black+silver Front brake width: 89mm Rear brake width: 90mm Brake disc diameter: 160mm Type: front brake, rear brake Package Included: 1 x Brake 1 x Brake Disc Notes: 1. Due to the difference between different monitors, the picture may not reflect the actual color of the item. We guarantee the style is the same as shown in the pictures. 2. Due to different personal measuring techniques, there might be 1-7cm error of the physical. Thank you!